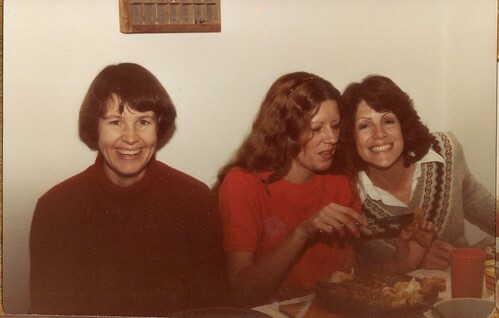 My mom, my aunt Linda and my aunt Alice. 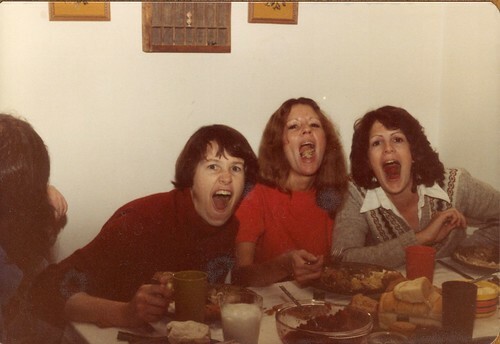 Today, as always, I'm most grateful for my big, goofy family. 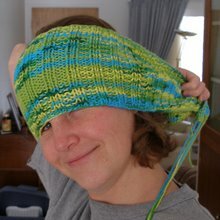 I just wanted to write a quick note to draw your attention to a new section of my blog. You can see it over there on the left, just underneath the search box. It's a list of 3 random goodies that I've found on the internets and I'll be changing them out once or twice a week (or more often if you guys want). Also, you may have noticed that I've been writing quotes up at the top of the page. I've always loved collecting interesting thoughts and figured I'd put them to good use. 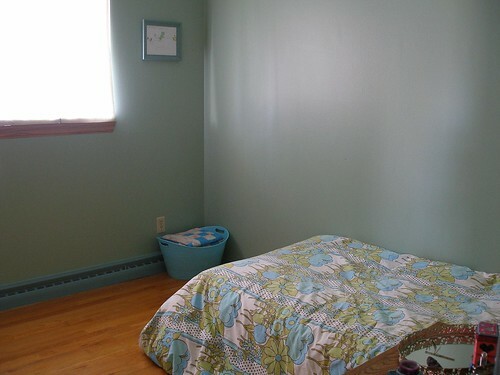 As I believe I mentioned, the original inspiration for Randa’s room redecoration was a thrifted sheet. I really loved it and wanted to do something with it for myself (maybe in my craft room). But at the same time, I realized that it would look great turned into a comforter for Randa. I guess part of me was hoping that it would be too much for her, but when she saw it, she said, “Oh, I love it,” so it was settled. Slightly Off-Topic Thoughts- In case any of you are grossed out by using thrifted (and well washed) sheets, just think of how many people have slept (and done Lord-knows-what) on hotel sheets. As far as I know, no one has ever contracted any communicable diseases from sleeping at a motel. Well, I’m sure plenty have, but I seriously doubt it was from the sheets. 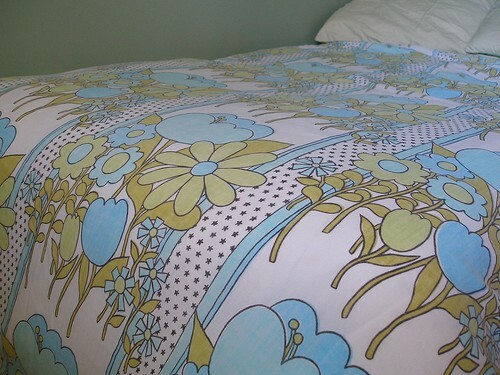 I'd also found another plain white, jersey knit sheet that was super soft. I thought it would be perfect for the underside of the cover. But, unless you’re experienced with working with jersey fabric (and if you are, I have a hard time believing you’d need my advice on how to sew anything), I wouldn’t suggest using it. That stuff is too fiddley. And stretchy. Which made the sides go a bit wonky. But, in the end, it didn’t matter too much because the down comforter inside is fairly poufey and hides a lot of mistakes. To make this, I basically used 2 sheets, sewn up on 3 edges (the top and both sides). To close up the bottom, you could use snaps, velcro, buttons or ties. I haven't figured out which is my favorite way, so I'll let you decide for yourself. If any of you out there are interested in more detailed instructions, just let me know. I've got plans for two more of these (though the perfect sheets have yet to be found) so I can do up a tutorial if you'd like. Also, the bottom seam was uneven due to the jersey fabric. But Randa hasn’t noticed, so nobody had better tell her. So have you all been trying worm composting? For those of you who have, I thought I'd include some quick fixes for when things go wrong. 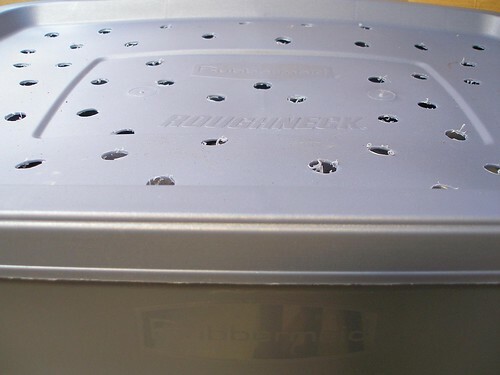 -If you have any pets (especially cats), it's important to make sure that your bin has a well ventilated lid that can't be moved by little paws. Before we started using these, our new little kitty really enjoyed using our bins as giant litter boxes. The big problem (besides the yuck factor) is the fact that cat waste can harbor some pretty nasty diseases that would be really bad to put anywhere near food crops. -If your bin smells bad, double check that all food scraps are buried at least two inches below the surface of the bedding. If you're OK on that front, dig down into the bedding to see if it is too wet. You can do one of two things… Dig in handfuls of dry but loose coconut fiber (or shredded paper). Or just leave the lid (or plastic) off for a couple of days. -If you don’t see very many worms at all, or if the food scraps don’t seem to be disappearing quickly enough, double check that the bedding isn’t too dry. You’ll want to dig down to the bottom when determining the dryness. It may be drier on top, but really wet at the bottom. If it does seem too dry, sprinkle extra water over the top, a little at a time, until the bedding seems to be wet enough. You probably won’t have this problem if using a plastic bin because there is very little evaporation in this set up. -I recently read a note on a website that says to be wary about adding banana peels because they tend to be heavily sprayed with pesticides (which will kill everything in the bin). I haven’t had this problem myself, but then again, we don’t eat an enormous amount of bananas and most of the ones we do are organically grown. This caution also applies to grass clippings that have been sprayed with pesticides as well as most horse manure (because most horses have been treated with a dewormer, which will kill your worms). -The book Worms Eat My Garbage: How to Set Up and Maintain a Worm Composting System by Mary Appelhof is a great reference. There is also a lot of information out there on the internet. Finally, if you have any problems that I haven’t addressed here, or you’re just not sure if your bed looks like it ought to, email me with questions. I really am happy to help. Once you get used to it, worm composting is so easy and worthwhile that we can all be doing it. 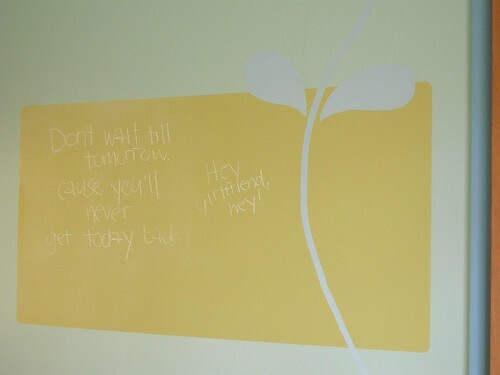 One of the main things that Randa wanted to incorporate into her new bedroom was a chalkboard painted on the wall. 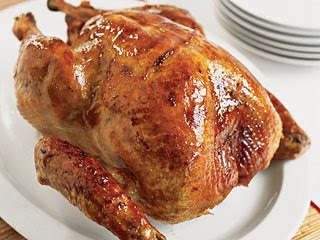 We used Martha’s recipe which allows you to mix it using any paint color you'd like. 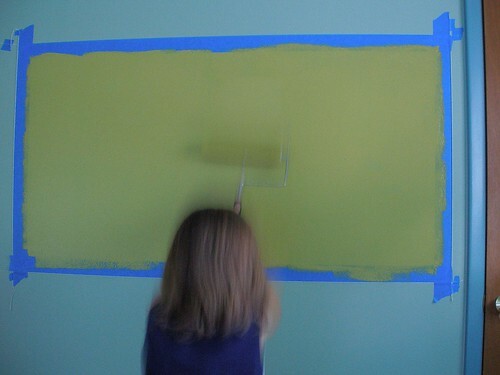 It is really so simple to do and I love that I was able to match it to the color of the room. 2 tablespoons unsanded tile grout. You mix them together and paint your surface. It came out well, with one modification. I used a paint roller to apply it. I found this to be necessary because I had a hard time getting the grout mixed in completely. It just wanted to stay all clumped up. As I stirred and stirred, it started getting thicker, but the chunks of grout remained. I was worried that the whole thing would harden up before I ever got it on the wall. So I just decided to finish mixing it directly on the wall. I rolled it on and then rolled over and over and over pressing firmly until all the clumps just got smooshed out. Does that make sense? It’s basically the way you’re not supposed to paint walls, if that helps clarify things. I suppose if you had one of those paint mixer dealies that you can use with a drill that would probably solve the problem too. I've since learned that if you mix the grout with just a smidge of water, enough to make a thin paste before you add the paint a bit at a time, that you won't end up with so many lumps. Since the first update, I've learned that for some reason, mixing it with water actually seems to make the surface somewhat incompatible with chalk markers, which I have come to adore. Instead of mixing the grout with a small amount of water, it works best to mix it with a small amount of paint first. Breaking up all the lumps is much easier if you're working with a couple of tablespoons instead of the entire cup. Once it's smooth, mix in the rest of the paint. -To get nice straight lines, I taped up string first and then I ran the lines of tape. -For the vertical lines I attached the paint can opener (or anything heavy) to the end of the strings to make the line plumb, then taped it in place once it stopped swinging. -To get the rounded corners, I cut a piece of thick junkmail to the right shape and used it as a guide to cut pieces of tape on a self healing mat. -I did clean the roller outside because I was none too keen to be putting grout down our pipes. -We did two coats, which worked fine. -After it dries, it's important to condition the chalkboard before using it, especially if you're using chalk ink markers. You can do this by rubbing the side of a piece of chalk all over the surface. I've found that using a big piece of white, sidewalk chalk is easiest. I think this stuff works even better than the pre-made chalkboard paint. It’s certainly prettier. And the chalk wipes off very easily. Yes, it's functional. Woo hoo! This last weekend I set the single goal for myself (and by association for Jeff) to completely finish the carpet removal project in Randa's room. For those of you who remember when I actually started this project, please pretend that it occurred only a week or two ago. When last seen, the baseboard looked like this. 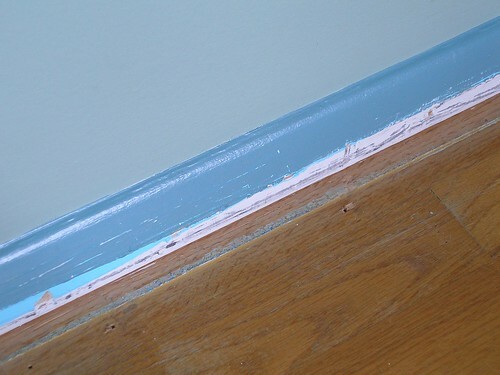 -Scraping the baseboard free of chunks of paint with the awesome scraper/nail remover tool. -Measuring, cutting and nailing in place a bunch of quarter round following this tutorial 1, 2, 3. -Filling all the nail holes (and, cough cough, the unexpected gap between baseboard and quarter round) with spackle (because I like spackle better than wood putty, but if you weren't planning to paint these, definitely go with the putty). I would like to reiterate the fact that this is a somewhat temporary fix until I'm feeling super ambitious and am ready to pull up the carpet in the entire upstairs. 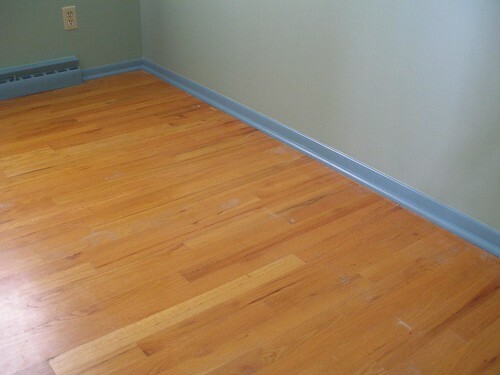 At that point we'll actually sand down and refinish all the floors. For the amount of effort that we've put in (not that much, really) I'm super pleased with the results. And don't tell Jeff, but I kind of like the distressed scuffed up look. I think it feels more homey than a super smooth and shiny finish would. 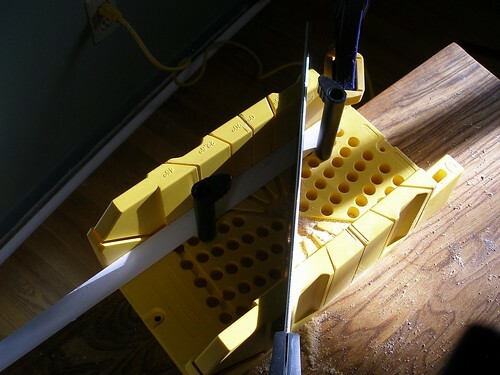 I'd also like to add that a miter box is a crucial (and fairly inexpensive) tool if you don't already own a miter chop saw. You'll need it to get the angles right so the pieces go together properly. Every time Jeff nailed down a piece I had an overwhelming urge to dial 91 and then hold my finger over the last 1. So it's because of this ridiculousness of mine that Jeff insisted that I nail down the last piece of quarter round myself. And I didn't even get any nails lodged in my brain. At least I don't think I did. Angeleen tagged me for a meme, but gave me a special assignment which I've only recently gotten around to doing. The strangest things I've ever eaten. 4- ants. During the 80's our dad took some wilderness survival classes. He came home and taught us that a human could live for quite some time on ants alone. The trick is that you have to pull the heads off first, so they don't bite you on the way down. Somehow he actually convinced me to try one. My siblings would have none of it, though. And since I didn't want to be the only fool who'd eaten bugs, I told them the following information. The red ones tasted like cinnamon and the black ones like licorice. Do they really? Ya, like I'm gonna tell. 5) goldenseal extract. This stuff looks and tastes like liquid earwax. In fact, I'm not entirely convinced that it isn't. 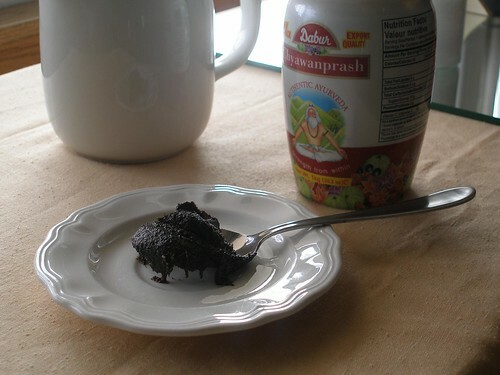 6) Chyawanprash. I've been told that kids in India take this stuff every day, just like a Flintstone Vitamin. It's an ancient Ayurvedic formula that is credited with getting a really old guy a really hot young wife. It's good to take when you feel yourself getting a cold. I, personally, don't think it tastes all that bad, kind of a spicy, sweet, sour flavor. Jeff thinks it looks like meconium. He's right. So if you'd like to play along with this meme, consider yourself tagged. I'm sure there's way weirder stuff out there. I just haven't eaten it. In recent days, I’ve began to feel somewhat panicked. What if the polls are completely wrong and Obama loses? What if not only McCain wins, but, God forbid, he dies sometime during his presidency? Palin scares me worse than Dub-Ya did. I see her with a scary combination of Bush's intelligence and Cheney's drive. I fear living in a country where she is commander in chief, but I fear living outside of it even more. It seems that so much depends on the outcome of this one election. I’ve cast my vote and knocked on doors, but those actions seemed so small compared to the magnitude of what we’re facing. And I have been working to put it in perspective. Jenny and I talked about how, win or lose, Obama has inspired so many people. And I do know that even if he wins, all of our problems will not magically disappear. And I also know that much worse things than John McCain becoming president have occurred in our nation’s history. Although I knew these things rationally, I couldn’t really believe them in my heart. And this morning, I knew I needed to do something to get rid of the worry I was feeling. And then I realized what part of the problem was. When I think of the change that I’m hoping for, it’s always in the future. Never something that could be achieved here and now. This isn’t a new idea to me, it’s something I’ve worked on in the past. Part of what I hope for in my life, in the world, isn’t just about what we’ll do, but who we’ll be and how we’ll feel. It has to do with how one human looks at another. Do we do so with love and compassion or with fear and distrust? This is a crucial question. Maybe *the* crucial question. 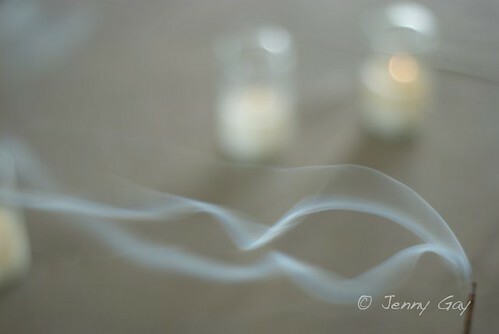 And so I pulled my energy back toward myself, back to my thoughts, my feelings and my actions. And then I felt that change in my heart that I was looking for. That our future does not hinge on one thing, no matter how wildly important it seems at the time. It’s the daily moments, hundreds, thousands… trillions of them, that create our world. Yes, much will change with the outcome of this election, but it isn’t everything. And it isn’t so much that we can’t continue to put things right day by day and breath by breath. Knowing this helped me to finally let go. 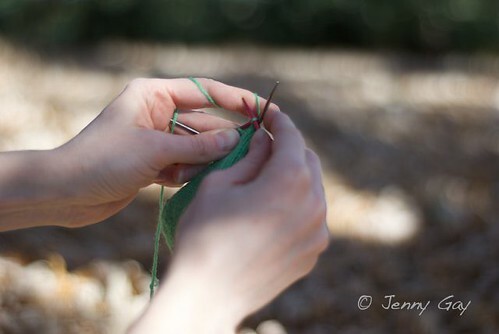 So today we will spend the day knitting and making tea and being the best people we know how to be. We will hold a vision of the world we want, the world we all deserve. We will drive people to the polls who need the ride and we will bring snacks to those standing in line to vote, whether they support my candidate or not. I will remember that I’ve been shown how to be a good person by one of the best. And that we are all in this together, however the chips may fall. So, Deb was the first to guess the theme for the jack o lanterns... Stephen King movies. And Brenda was the first to correctly identify all the faces... the clown from IT, Stephen King himself, Sissy Spacek from Carrie and Jack Nicholson from The Shining. If you ladies could email me your addresses and your color choice (you can see all the available colors here), I'll get a necklace out to each of you. 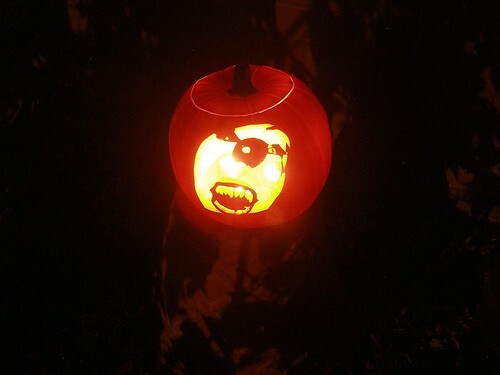 Here's the final pumpkin that I carved up on Friday afternoon. I think this is my favorite, even though it's actually the one that looks the worst from up close. It's Johnny Depp from The Secret Window, a movie that, frankly, scared the bejeesus out of me. Mostly because I like to take naps. At least I *remember* liking naps, back when there were enough hours in the day. 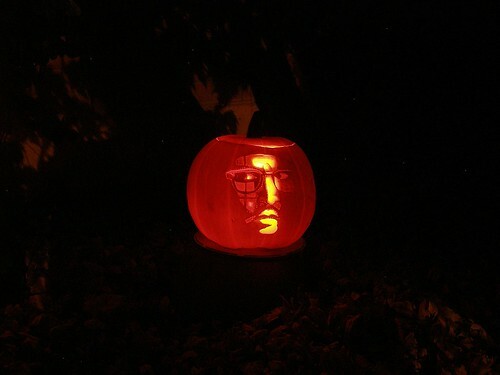 I think the angle of the Pennywise pumpkin might have made it difficult to identify. Here's a different one. Oh and since I've had a couple of people ask, we didn't buy these patterns. We printed up super high contrast black and white pictures and carved from those. I'm already thinking about what I want to do next year. Though I'll be restricting all internet searching to daylight hours.